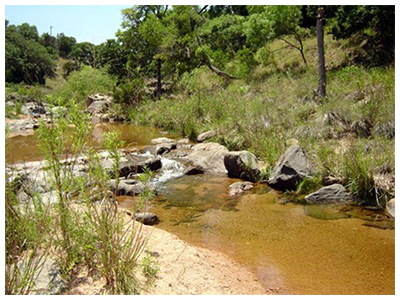 GCE conducted a Master Drainage Study for the 150 square-mile Chocolate Bayou Watershed in Brazoria County, Texas. The initial purpose of the study was to address drainage needs and prepare a drainage plan for a 2,100 acre development in this rapidly growing area south of Houston; however it was necessary to examine the entire watershed to provide a mitigation plan for any impacts resulting from the development. The study involved revisions to the entire watershed HEC models, including the West Fork of Chocolate Bayou, Chocolate Bayou, and three Chocolate Bayou tributaries. New sub-drainage areas were delineated; the floodplain and floodway were re-mapped using HEC-HMS/HEC-RAS modeling; which formed the basis for overall drainage requirements. The engineering services for Phase I included detailed drainage analysis for a 275-acre area, design of roadway, drainage, and utilities, and preparation of construction plans, specifications, and estimates. A series of storm water detention ponds was designed by integrating HEC-RAS models indicated above with ICPR-3 modeling to simulate the interconnected pond routing with variable tail-water conditions. A hydrodynamic design analysis was performed for the storm drainage system using XPSWMM. The analysis accounted for storm sewer flows as well as overland flow through road ROW and other channels subjected to dynamic tail-water conditions. The system was optimized to limit street ponding to 9 inches above gutter per the local City requirements while maximizing the overall cost savings. The final design for the 2,100 acre development included a system of over 40 detention ponds and other waterways to ensure no adverse impacts on the Chocolate Bayou Watershed. GCE was also responsible for securing approvals and permits by USACE, TCEQ, FEMA, TPWD, Brazoria Drainage District #5, Kinder Morgan Pipeline Co., BNSF, and local Cities.